Gold Eagle coin mintage history uncovers many interesting facts that allow numismatists to learn more about America’s favorite gold coins. According to the law, all gold content that goes in the Gold Eagle coin mintage must come from domestically mined gold sources. Silver and copper alloys that are added into these coins allow them to maintain their superior scratch resistant status compared to 24 karat gold coins that are prone to considerable wear over time. Did you know that American numismatists disliked the Roman Numerals dates that appeared on the coins during the first six years of Gold Eagle mintage? Coin collectors and investors expressed considerable confusion as to their ability to tell the actual year of mintage on the first American Eagles. American Government listened and starting in the year of 1992 Gold Eagle coin mintage no longer displayed confusing for some collectors Roman numerals. Another interesting fact about the mintage of American Eagles is the confusion and ever changing mintage numbers that make it hard for some coin collectors to judge which mintage year to include in their collection. According to the general rule, the fewer the mintage numbers are the more collector value American Eagles are going to gain in the future. However, the final official mintage quantities are published sometimes years later after the mintage sales were carefully analyzed and evaluated. 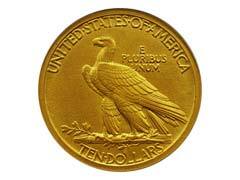 This explains why Gold Eagle mintage figures might differ from source to source. American Eagle gold bullion coins price directly reflects its actual gold content and any premium and shipping costs that come with purchasing them from various coin dealers or mints. According to interesting historical facts, 1933 Double Eagle gold coins are highly coveted among coin collectors all over the world and sell sometimes for several million dollars per one coin piece. The rarity factor of these coins is due to unfortunate fact that the majority of Double Eagles were melted down during the Great Depression Era in the US and very few coins remain today day in private collections across the globe. To provide superior protection for your coins from especially rare Gold Eagle coin mintages, consider buying a gold eagle coin holder or a custom made wood plaque that will allow you to show off your numismatic collection in its full splendor. Coin holders are available in many styles and price ranges, and you are sure to find the one that you need to meet your preference.